Check out this month's caption contest for your chance to win a major award! This is not the picture for the caption contest. The prize this go-around is a little wishlist I've created for the "Hacker on the Go." This wishlist is a collection of my favorite tools for when you're out and about and might need to, ya know, do electronics stuff. It consists of the following products: a SolderPro butane soldering iron, a 10-gram tube of solder, 6" digital calipers, some diagonal cutters, a digital multimeter, the Heaterizer XL-3000 (and its irreverent manual), a liquid flux pen, some crimping pliers (now with JST action! ), a modular storage box, and - the pièce de résistance - a DSO Nano V2 pocket-size digital oscilloscope. On the 4th day of Christmas my true love gave to me... 4 pretend owls, 3 new ornaments, 2 matching speakers, and a creepy guy standing by a tree. ~ Questionable Content reference is too good here. Nic is like Jane Goodall but for plastic owls. It took him a long time to earn their trust. They accept him as part of the parliament now. After finally finishing his "system" Jeff pauses to remember all the fine owls lost during development. Hipster Engineer - "It's called hooting, you probably never heard of it..."
Iâm singing â¦ Iâm by a tree and Iâm singing â¦ IâM BY A TREE AND IâM SINGING! I was just watching that movie this morning! Programs in OWL. Forever Alone. Unsatisfied by the answers from his youth, the young boy decided to gather an entire owl panel to determine how many licks it REALLY takes to get the center of a tootsie pop! This week on the Red Green show we're going to show you how to light up your Christmas owls with some duct tape, Christmas lights, and only 1/2 gallon of gasoline. The new 4 core Owlduino. Nice set of hooters you got there. Although he looks inocent, he's secretly waiting to deploy his ardupilot controlled owls, which will be the cause of the end of the world on Friday. Is that related to the golden eagle that swept the fake kid away? Asher Brewing kicked these guys out for not being organic. Turns out Avery is not an Aviary. So these guys settled at SparkFun, because they'll let anyone in. At least someone prepared for the Mayan apocalypse. Due to recent economic hard times (evidenced by his slim figure), Santa needs to rethink his method of delivery. This was Santa's last hope for traveling in the storm. Luckily, Rudolph showed up just in time. Oh, maybe this career path is why I do not have a girl. And now my feathered friends, we begin our assault! This year's Christmas party is going to be a real HOOT! 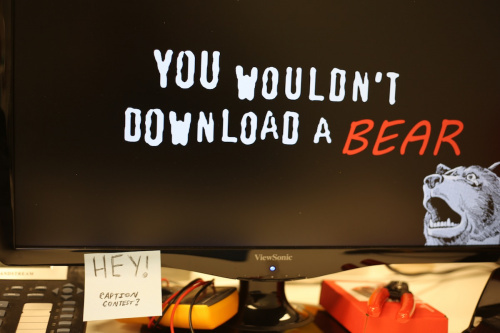 You wouldn't download a bear, but it looks like this guy just might. In a futile attempt to allow his pet owls to control his computer with their thoughts using the MakeyMakey, he accidentally created a race of hyper-intelligent cyborg owls destined to take over the world. Turn around! Your tree is on FIRE! Foolish human, these owls don't need a dentist! When Santa was younger, and considerably lighter, he was able to power the sleigh with only four owls. All these years they said I was a squib. But I finally got my letter from Hogwarts. Owl be home four Christmas! "When Billy Ray said he loved his hooters I was confused. Until now..."
This is the last photo taken before the tragic extinction of the worlds last horned owls. The effort to multiply the species though charged particle duplication went sadly awry. Thanks to Dr. Seuss' strict copyright laws, "All the Whos in Whoville" took on a much more literal meaning. Is the winner going to be announced ? DJ Shelf doing sound checks for tonight's hootenanny. How many owls does it take to change a lightbulb? And after The makey Makey Banana piano we are happy to introduce the christmas owl Piano! Why am I such a misfit? I am not just a nit wit! If you look closely, you will notice that the owl on the right is a mayan statue. They disguise themselves... AND STRIKE! Sparkun, fuelling DIY electronics day and night. Sparkfun, hooting electronics since Christmas seasons. Having a hoot. Beards and baubles style. If you're going to bet the boss about the end of the world, never take the Mayans by a field goal. "Merry Christmas from the Sparkfun New Product Development Team"
Hooters bounce when you drop 'em! Hoot Damn You. All 5 of You! This Christmas SparkFun ran a survey: Three out of four owls agree ... it take three licks to get to the center of a Tootsie Roll Pop. I armed my UAV pigeon but don't want to let it ruin my holiday. Nordberg's attempt at using electro-shock to train his owls to 'hoot' Oh Tannenbaum was not entirely successful. At least if the world ends, I'll be with my best friends. Don't judge. "That's when it hit me," he told Tom Wilmes of the Daily Camera, " I finally understood why my college roommates interrupted all my late night Saturday study sessions to brag about seeing a nice set of hooters. I now share that same passion." Gee Honey, I know I said I wanted a set of artificial hooters for Christmas, but this isn't quite what I meant. wHo wHo wHo wHo, Makey Christmas Everyone! Santa, I said an album by the Who and a Yo yo. Put a couple LED lights in this tree !!! Welcome to Hogwarts Electronics Engineering department! Op, op, op, op, oppan Sparkfun Style! Whooo goes there? Whooo? Just a dentist? WHO is that guy with the big eyes? After decades of searching, Hermie finally finds the perfect family for his dental practice. Four electronic birds, Three LED strips, Two Makey Makey's and Nick in a Funny Hat! Happy HOwlidays! Electro-shock therapy proved ineffective at getting the owls into a festive mood. It took me many years. I found Waldo -- Whoo Whoo! psst, He is right there behind the wired owls. This Sparkfun Christmas is brought to you by Brawny Paper Towels. Woot, woot, woot, woot, it's a Sparkfun Christmas! "Yes, this special collection of Christmas classics recorded by The Owls can be yours for the low, low price of $19.99 (plus shipping and handling). Just call 1-800-555-6957, that's 1-800-555-OWLS. Our operators are standing by..."
I don't remember much of the Christmas party, but the elf tells me it was a hoot. Shouldn't have ordered those plastic pigeons from China. No matter how many owls you have, your tree may still catch on fire. "One of these things is not like the others..." "One of these things just doesn't belong..."
Must be cold in there Robert is double hat-ing it. "Who" is the the "misfit"? No Sparks around the tree please, just fun. Lumberjacks can build computers too, it's just they don't tweet. "Who" is ready for Christmas? This Guy! Al Borland's audition to be Robert's new sidekick for the New Product Friday videos was a hoot. Give a hoot, don't electrocute! This is how we at Sparkfun go Owling. I gave an ungrateful mouse a cookie -- and these owls have agreed to teach me how to track it down, so I can get it back. When it comes to Christmas, we really give a hoot! To ensure correct operation of the MaKey MaKey please ensure that your owls are not grounded. Everyone knew the acronyms USB and HID, but OWL was a new one. Really mom, only only the 200W laser editions? All your birdhouses are belong to us. OWL right here, nOWL yOWL need to cOWLm dOWLn nOWL. I received a trifecta of euphonious avians for Christmas. What did you get? Bearded Mary, visited by four wise men (one of them didn't get the memo)! Doesn't this make you feel better about going home for the holidays? According to my OWLgebra, we need (the LOGarithm of 10,000) owls to be able to generate enough power for the company Christmas tree. Take cover, the Christmas tree is under fire! K, think these hats will do? Yes, yes, I know they're your special decorations, Honey. But seriously! Look how cool this is! "We shopped at Sparkfun, and all we got was this dope in a Santa hat!!" Herb Gilquist displays the owls he found hiding in the Christmas tree he purchased at the Walmart this year. Using various fancy electronic gizmos, Herb was able to coax them out of the tree so he could shoot, stuff and mount them for eventual display on the mantle of his yuletide fireplace as is the Gilquist family tradition. Chuck Testa? Nope, Sparkfun Electronics! This isn't what Nic envisioned when he excitedly volunteered to "play the musical hooters". He won't MaKey MaKey that mistake again. It's not a Sparkfun party until someone develops an elaborate way to scare a Ornithophob. Pork-chop dispute at holiday party ends with man fatally shooting company mascot owls. Because Christmas and creepy looking (possibly Arduino controlled) owls go together perfectly. Owl I want for Christmas is my two front teeth. "Hello, Sparkfun Tech Support? These speakers you sent appear dead! I instrumented them with your Speaker Audio Noise Transfer Adapter test board, and there is no response from the OWL v4.1 output interface. Help!" it's incredible how "random" these caption contest pictures are... who the hell had the idea "let's put a guy with 4 owls and a christmas background for the caption contest"? The choir rehearsing for SparkFun's first annual "Oh, Owl-y Night"
I should have been a DENTIST! Wise MEN, wise MEN ... and there were only THREE. Look, lets just skip the Nativity Scene this year! Pat, can I buy an owl? In his quest for more patients, Hermey ran into another Abominable Snow Monster and four Misfit toys! We listened to your feedback and revised the Owl Shields so that you no longer had to reach into its rear to change the I2C address jumpers. In a most unfortunate turn of events, Dave's hopes of competing in the annual Mechanical Owl Quartet Christmas Music Contest were ruined, due to a burning tree. Investegations are pending on the actions of his rival, Hermie Elf. ALL YOUR LUMBERJACKS/MAKEYMAKEYED OWLS ARE BELONG TO US! That Christmas, Bob realized he was adopted. Early in prototyping, the four calling birds were beginning to take form. Hmm... someone obviously has a plastic mouse problem. An early attempt by Hooters to compete with Showbiz Pizza's Rock-afire band. In the end, they went with a different type of attraction. The real reason why the New Product Posts are such a hoot! A noble -- yet failed -- experiment to harness the power of owl brainwaves. The xmas caroling was beautiful until Jerry - the house elf - hit a note that the owls recognized as common forest rodent. After that, it was all death-from-above and no awasseling of any kind. this new product post we are offering a new kit, The Owl Synth. this is a great kit to get you started with the Makey Makey, it includes the makey makey starter pack, 4 plastic owls and a bearded Sparkfun employee to offer assistance when you need it. well, Thatâs all I've got this week. check back in later to see more new products and other posts on the homepage. Thanks for reading. Hermey and the Three Wise Owls conspire to set Santa right about the lack of ornamentation on the tree this year. Budget cuts be damned, they have petitioned to have their friend known colloquially as "Spare Owl Number Four" hired as Decorator for next year's tree for which he has submitted a comprehensive proposal which features swooping the tinsel into artful festoons, bravely bucking the current trend for tightly belted bands which tend to cut off circulation to the tree's branches. Number Four suggests increasing the level of ornamentation from one wee paper thing to a full flock of faux turtle doves and their accompanying detritus, some french hens with pearly feathered head wraps, glittery shawls adorned with copious amounts of glitter and a liberal smattering of loosely interspersed gold rings. Number Four has also vowed to replace the satanic looking swoop currently gracing the summit of this year's tree with something a bit more angelic. References to be provided on request. Puny human, you have failed in preventing Morbo from creating his race of super mutants. Its great to have everyone together for the holidays! Concerning our pest problem: Someone has been leaving food around, and it's attracting owls. Mr. Santa Claus turned those poor owls into autonomous robots. Given his failures controlling sled dogs, it was no surprise that Yukon Cornelius had even worse results with owls. Here is Owl Engineering Department. Welcome to St. Aegolius Academy for Orphaned Owls. Now everyone stare at the Santa hat. That's right, just stare at it... Mwahahaha! You've now all been Santa-blinked! "SparkFun invites Oehoes to develop Lilypad navigation lights during the Christmas holidays." Hey, your Christmas Tree is on fire! Santa's nephew wanted to be an ornithologists which was Hermie's second choice of study after getting kicked out of dentist school for lighting a Christmas tree on fire. It all happened so fast. But I'm certain it was the little guy in the blue suit and the third owl from the left. Owlet you know how this turns out. Years later, Rocky always considered the "Santa Hat and 4 owls performance" to be the low point in his career ! It's still not authentic, but it's a lot better than those dove/turtle abominations he constructed last year. After this, the two beer limit was strictly enforced ! Who who whoooo will talk to me? Putting some spark into the winter spirit, our automated owl drones will stop the jolliest of intruders. So when I rolled the Christmas Dice, I didn't realize I was rolling for owls... I'm just glad I didn't get snake eyes. "I think they look better when they have a little star, or an angel on top" - Lucy, in "It's Christmastime Again, Charlie Brown". Owl I want for Christmas is a little respect. Much to Santa's dismay, the elves got hacking when Rudolph's nose burned out. Despite an open and generally loose set of rules at SparkFun, new regulations regarding caroling had to be implemented after the Owl Choir experiment resulted in the activation of NORAD, even amidst their usual shenanigans of tracking Santa. Welcome to our Holiday episode of "Owls Today". This morning on the show we have a special guest, Herbie the Elf Dentist, who will discuss Spotted Owl gum disease and you. Santa, I know I've spent over $20 million in research and development but I think I've really hit the nail on the head this time. OwlPod!! The kids are going to go nuts over them. seconds later, due to Dave's inadequate screw tightening, the tree came crashing down under the weight of the Sparkfun flame ! These should keep the partridges out of the pear tree. "Of course owls can chirp. They use RADAR to navigate, don't they?" Picture taken 15 seconds before Bob discovered that "YOLO" didn't mean, "You Obviously Like Owls". Only a true redneck wears a basball cap under his Santa Hat ! No owls were harmed in the taking of this picture. Anybody seen my ol' Hedwig with my magic electronic parts order ? You got me what for Christmas?!! As much as Hermey wanted to be a dentist it just didn't pan out so he took the only other job he could find, working with his Large gangly elf cousin categorizing different species of plastic owls. This is the problem with engineering, sometimes you need to take a step back and think "Are these ornaments REALLY going to fit on the tree?" If you like these, you should see what I have in my basement. Then the WHOs down in WHOville will all cry "BooWHOWHO"
No matter who, who, who, who is on your Christmas list. They will love their present from Sparkfun. Teddy bear: What am i doing here!?? "In this Christmas Episode of Lumberjack Electronics, I'll show you how to Charlieplex your spotted owls!" Owl bet you've never seen one of these before. ... I asked you to make a beautifull christmas scene, adding a lumberjack with a santa hat doesn't add more "magic" to it ! At least he came with a tree. This may look weird... but its better than dealing with politicians. "He is in love with owl city!" No one will get into the presents early this year. Through the use of 'Shock Therapy' these owls DO NOT BLINK! You think I'm about to hack these fake Owls.... NOPE! Chuck Testa. The owls ears pricked up, it's eyes wide in surprise, and it found exactly what a man in a Santa hat was capable of ! Why are there no lights on that tree?? Now presenting, Hermey and the Night Owl 5!! Second owl to the left, and straight on until morning. Looks like the McManus brothers got to the owl on the left. Until his therapist would let him invite real people to his parties, plastic robot owls would suffice. "Hi I'm santa and I decided to screw the slay this year and we stole some of Harry Potter's owls to deliver the presents this year." 50% off all owls was impossible to resist. A slight smirk appears on his face when he thinks of the joy this will bring to the kids on his Christmas list. And just in time for Christmas, Version 1.0 of our Arduino powered Angry Birds Robots. Owl show them the meaning of Christmas! Herbie was right, I should have become a Dentist too!!! Here i am in front of everyone introducing myself at "The Island For The Misfit Toys Annual Meet And Greet". His christmas jokes were so terrible he had them 'owling in the isles. Let's see - Left ear? Right ear?. No wonder the elf looks happy. In this video, I will be demonstrating how to communicate between multiple devices using the I-hoot-C protocol. Human Rights Activists call for end to Input Device Owls. Terry the Lumberjack and the Four Displaced Avians. Who is the wisest? My vote is the Christmas tree. A lumberjack showing off a days work. Four night owls... and Bob, who goes to bed at eight. Give a hoot - don't electrocute! Who knew working here would be such a hoot? I know it's not the contest picture, but... I ALWAYS download my beer. AFTER I'm done enjoying it! 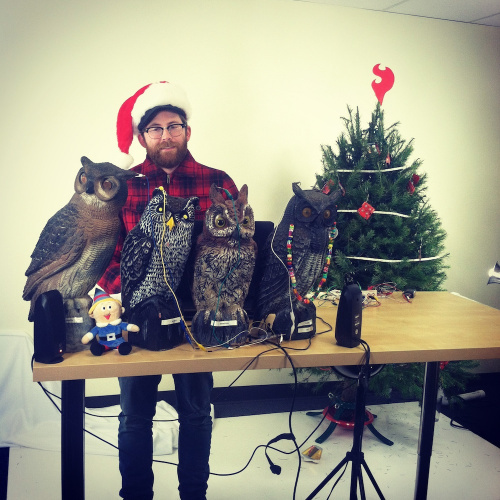 He sure brings the Christmas-owl spirit to Sparkfun! It's a Techno Hoot Christmas!